As South Korea and North Korea confirmed their commitment to “complete denuclearization” of the Korean Peninsula during a historic inter-Korean summit Friday, experts were divided over whether the declaration was a breakthrough for North Korea’s nuclear standoff. 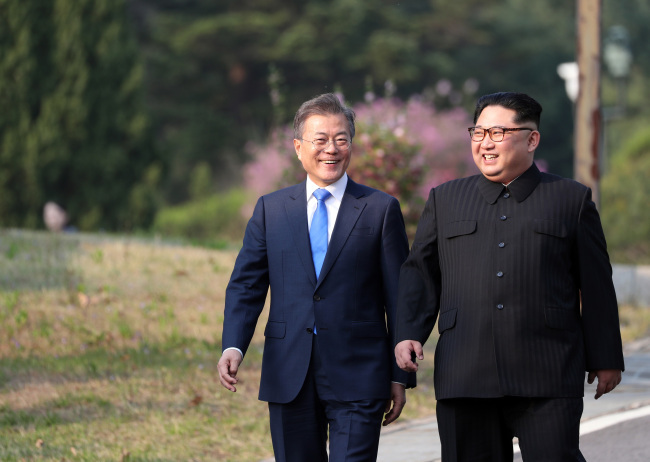 South Korean President Moon Jae-in and North Korean leader Kim Jong-un confirmed “the common goal of realizing, through complete denuclearization, a nuclear-free Korean Peninsula” in a joint statement. Some experts called the declaration “significant progress” that could lay the groundwork for the upcoming summit between North Korea and the US, while others said it fell short of showing the reclusive regime’s willingness to denuclearize in a “complete, verifiable and irreversible” way as demanded by the US. The inter-Korean summit is seen as a precursor to the summit between the North Korean leader and US President Donald Trump expected to be held in May or early June to negotiate the North’s nuclear weapons program. “North Korea’s commitment to ‘complete’ denuclearization implies ‘complete, verifiable and irreversible denuclearization’ demanded by the US,” he said. The declaration drew the “best results” possible for the two Koreas seeking to establish “solid” inter-Korean relations, breaking from the past when their relations were largely swayed by North Korea-US relations and US-China relations, another expert said. 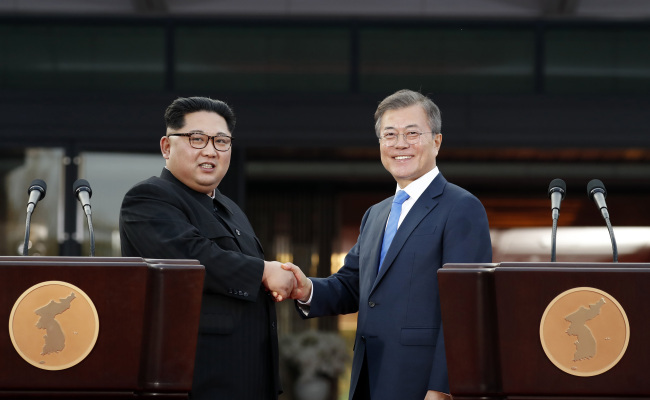 “Through the firm inter-Korean relations, South Korea can lead the North to denuclearize and serve as a bridge between North Korea and the US for them to build new relations,” said Kim Dong-yup, a professor at Kyungnam University’s Far East Institute. However, the two Korea’s commitment to “denuclearization of the Korean Peninsula” leaves room for different interpretations for stakeholders, which could complicate the process of ending the nuclear deadlock, another expert said. “It is meaningful that North Korean leader Kim Jong-un mentioned ’denuclearization‘ himself, but he fell short of mentioning what specific measures he would take,” said Shin Beom-chul, a senior researcher at the Asan Institute for Policy Studies. “It is a sophisticated agreement that could leave the momentum of North Korea-US dialogue alive but at the same time allow North Korea to maintain its strategic status,” he said. Park Won-gon, a professor at Handong Global University, echoed a similar view. The US and South Korea have demanded the North give up its nuclear weapons in a complete, verifiable and irreversible manner. North Korea, on the other hand, suggested “phased and synchronized” measures for denuclearization. “With the goal of denuclearizing the Korean Peninsula in mind, the Koreas discussed realistic ways, taking into account positions of both North Korea and the US and previous negotiating experience over nuclear weapons programs,” the presidential office said after the summit. In the declaration, the two Koreas also agreed that they would seek a permanent end to the 1950-1953 Korean War within this year. The war ended in an armistice, not a peace treaty, leaving the two Koreas technically at war. The two Koreas will seek meetings with the US and possibly China, both of whom are signatories to the ceasefire, to establish a permanent and solid peace regime, according to the declaration. ”But ending the Korean War, establishing a peace regime and improving inter-Korean relations are all tied to a significant progress in the North’s denuclearization,” Park said. 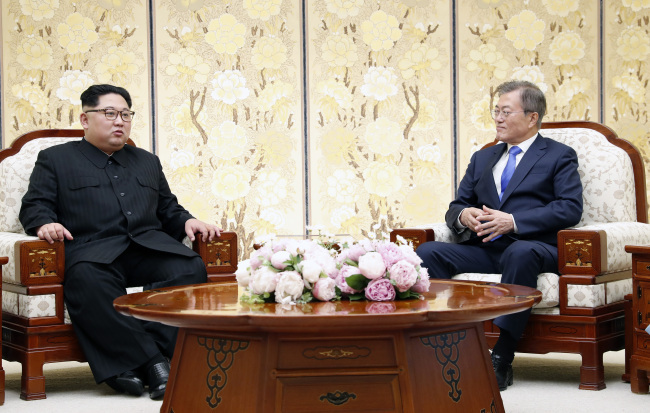 The two Koreas’ leaders also agreed to cease cross-border hostilities and return the heavily fortified demilitarized zone to its original state. To achieve this, they pledged to suspend propaganda broadcasts on loudspeakers along the DMZ and the sending of propaganda leaflets toward each other’s territories. 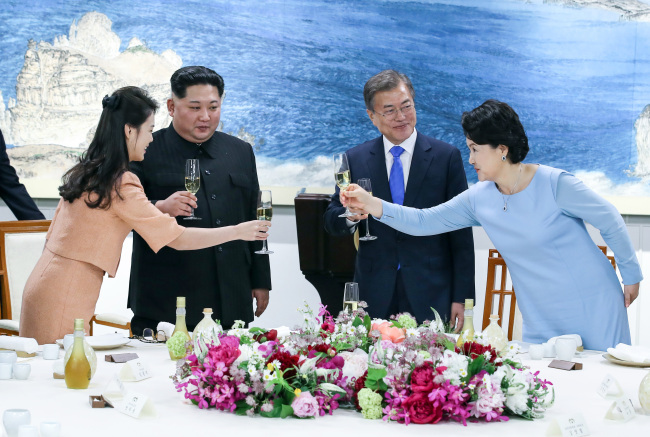 Moon and Kim also pledged to designate the waters close to the border with North Korea in the West Sea as a “peace zone” to prevent accidental military clashes and ensure the safety of fishery activities. “As a significant measure aimed at rebuilding military trust, we will completely demilitarize the DMZ region and turn the area into the peace zone,” the presidential office said after the summit. 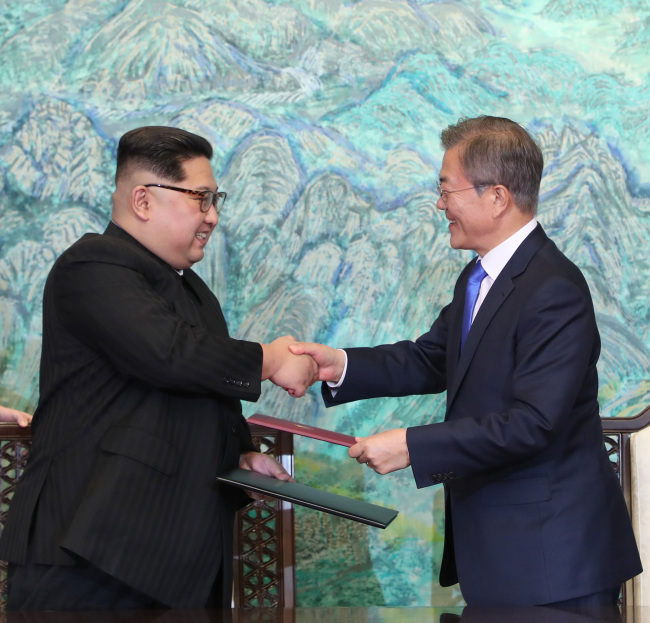 While the agreements reflected the two Koreas’ resolve to prevent miscalculations in the cross-border region, security experts cautioned that some agreements still appear ambiguous and controversial. Woo Jung-yeop, a research fellow at the Sejong Institute, said that the two Koreas could clash over the definition of “hostile acts,” with North Korea exploiting it as an excuse to demand withdrawal of the US troops stationed in South Korea. Another analyst voiced concerns over plans to establish a jointly controlled “peace area” near the Northern Limit Line, a de facto maritime border with North Korea, where provocations, including the sinking of the South Korean warship Cheonan in 2010, have occurred. “Without North Korea’s acknowledgment or apology for past provocations, I don’t think the people in South Korea would agree with the move,” said Kim Dae-young, a military analyst at the Korea Research Institute for National Strategy. The improvement of inter-Korean ties was one of the key summit agenda items that South Korea had reiterated, and on Friday, both the South and North vowed to “bring forward the future of co-prosperity and unification” by facilitating advancement in bilateral relations. “The joint declaration embodies the firm will of both South and North Korean leaders to resolve issues on the peninsula and progress toward the future with an approach centered on inter-Korean ties,” said the professor Kim at Kyungnam University’s Far East Institute. Kim said that the goal of the summit was to create unique strengths in inter-Korean relations that would not be easily wavered by a “rollercoaster-like” progress toward denuclearization and obstacles in US-North ties. He added that by outlining solid exchanges on various levels coupled with humanitarian exchanges, the two could jointly make efforts to create strengths that could help them lead US-North Korea relations. Among fresh agreements reached is the establishment of a joint permanent liaison office in the North’s industrial city of Kaesong near the border. While the location of the liaison office led some to speculate that it may be a move to revive the Kaesong industrial park, experts said it may be too early to make such speculations. “Despite the location of the liaison office, it seems like an extension of the diplomatic hotlines both Koreas have been reviving in recent months,” said the senior researcher Hong Min at the KINU. The two Koreas reopened a cross-border hotline in Panmunjeom earlier this year, after North Korea offered an olive branch by expressing willingness to send athletes to the PyeongChang Winter Olympics. More recently, a separate telephone line was established between the leaders of the two Koreas, ahead of the summit. A ranking government official told reporters Friday that the hotline is more of a reaffirmation between the two on the tasks that should be prioritized. “(The clause) is more of a reaffirmation on the tasks that should be prioritized after negotiations on denuclearization or US-North Korea talks are held, rather than an immediate agreement on economic matters,” the official said. North Korea said on April 21 that it would shift its focus to economic advancement, announcing the completion of its byungjin policy, which pursues the parallel growth of its weapons program and economy.